F5 circuit was designed and offered to DIY Audio world by Mr. Nelson Pass. Thank you! If I recall correctly, it was 2002 when I decided to build a Class A amplifier. Due to the fact they are very inefficient (generate a lot of heat) the cost associated with the purchase of heat-sinks was a major deterrent from building them. Back then, the hot design in DIY audio world was also by Mr. Pass, the Zen Amplifier. I've put my Class A amp project on hold. After successfully completing few chip-amps, more or less a decade later, I've decided to finally build a Class A amplifier. Class A? Heat pipes to the rescue. Class A amplifiers are characterized by having excellent sound, being expensive, generating a lot of heat, and being big and bulky. I wanted to make my amps inexpensive and light. I have decided to use heat-pipe based heat-sinks commonly used in computers. In addition to fulfilling above requirement, they offer a unique look. Each MOSFET of the F5 has own heat-sink. 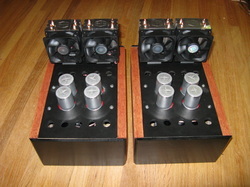 Each fan is under-volted to 6V, ensuring start up and very quiet operation. Each MOSFET dissipates approx 60W. Each mono-block has 300VA toroidal transformer with dual 18V secondaries. Capacitor bank contains four 47'000 micro Farad capacitors. Using 5A current limiter to prevent large charging current draw on power up. Rectifier bridges are mounted on finned aluminum heat-sinks, and they do get warm. LM117HVT based circuit was used to bring down the +/- 24V supply of F5 to 6V for the fans. Regulator also has small finned heat sink (not pictured). Chassis is made of wood, for the distinct look F5 deserves. 1/4" MDF top, front and back panels. I've drilled holes in top and bottom panels for improved air flow. After all, transformer and bridge rectifiers mounted on finned heat-sinks generate heat too. Each amp rests on rubber feet, for better air flow and dampening of mechanical vibrations from fans. It has less distortion. Bass seams little lean, but much cleaner. With the proper speakers (full range), you can't tell that the sound is coming from the actual speaker. It's almost like the performers are there with you in the room. I am discovering music all over again. Once again, thank you Mr. Pass for sharing the design with the DIY crowd.